Congrats to our co-founders for being named 2018 Edgewater Living Treasures! A huge thank you to the Edgewater Historical Society (EHS) for their recognition and support, and to the ever-fabulous Marjorie Fritz-Birch, who kindly introduced Ally and Carla and presented the award. While Ally is now off doing great things in Boston, she was there in spirit while Carla accepted the award. Also, after 26 hours of continuous travel the day before from a trip across the globe, Carla actually thought Ally was there anyway, along with an elephant and several characters from her favorite novels. A little more about the award from the EHS: This award honors those individuals who have made significant contributions to the community by enhancing the quality of life for its citizens. They are residents or former residents of the Edgewater area. They are individuals who have made an outstanding achievement to Edgewater, people who have set an example of community action, helping neighbors to accomplish worthwhile goals. These are people we admire for their dedication to real change, and their determination to have positive ideas turn into reality. 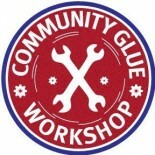 This entry was posted on June 12, 2018 by communityglueworkshop.